Strobilanthes are an interesting evergreen small to medium shrub with opposed leaves. The species Strobilanthes Gossypinus is a great foliage plant sometimes referred to as Persian Shield, although it is actually from the hilly areas of Southern India. Full sun to part shade and a well drained humus rich soil. All Strobilanthes species need protection from frost. The foliage is a silver to grey-green color with fine hairs to add texture. Strobilanthes do well in pots and add contrast in the border. Given good growing conditions it will reach a height of around 1 – 1.5m and form a nice rounded shape. Although from a warm climate this is a plant that prefers a little shade from the hot afternoon sun. Easy to maintain, prune to shape as required. Strobilanthes as reasonably drought tolerant once established. Good drainage during the colder months is essential. 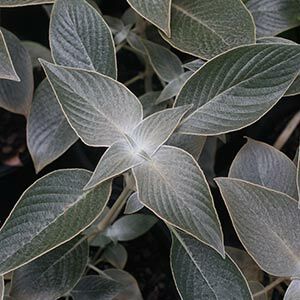 Try Strobilanthes between Magnolia little gem for a lower growing plant with great foliage contrast. Soil – Humus rich, moist, well drained. Drought tolerant once established. Plant Type – Perennial in warmer climates. Foliage – Felty soft silvery green. Landscaping Uses – Ground cover plant for mixed color with other plants. Good in coastal conditions. Excellent textured foliage. Propagation – Easy from softwood cuttings taken in spring.